Climate Communication | How do volcanoes influence climate? Home | What	`s New | Common Climate Questions | How do volcanoes influence climate? Q: How do volcanoes influence climate? A: Volcanoes can and do influence global climate, exerting a cooling influence for a few years. This cooling influence occurs when large, explosive volcanic eruptions inject sulfate particles into the high reaches of the atmosphere (the stratosphere). For example, the four major volcanic eruptions of the 20th Century caused short-term interruptions in the long-term warming trend caused by human induced emissions of heat-trapping gases. The steady warming trend of recent decades has been temporarily interrupted three times by large volcanic eruptions. 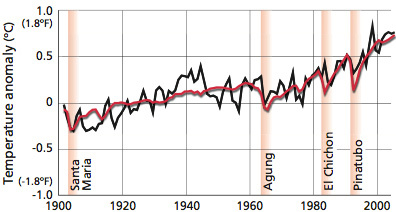 The red line is an average of climate model simulations for the 1900s and demonstrates the models’ ability to replicate the temperature impact of large volcanic eruptions. Contrarians have asked whether the CO2 emissions from volcanoes might impact climate. But in fact, this is insignificant compared to human activities. Burning fossil fuels releases several hundred times more CO2 than volcanoes do each year. Fossil fuel burning results in the emission of approximately 35 gigatons of CO2 into the atmosphere per year worldwide. This obviously dwarfs the estimated annual release of CO2 from volcanoes, which is 0.15 to 0.26 gigatons per year. Learn more about how natural factors, including volcanoes, influence warming.